Pickle and Bree’s Guide to Good Deeds is a new picture book series from Alison Reynolds and Mikki Butterley, published by Five Mile Press, that teaches kids 5-8 about values, teamwork and accepting differences. 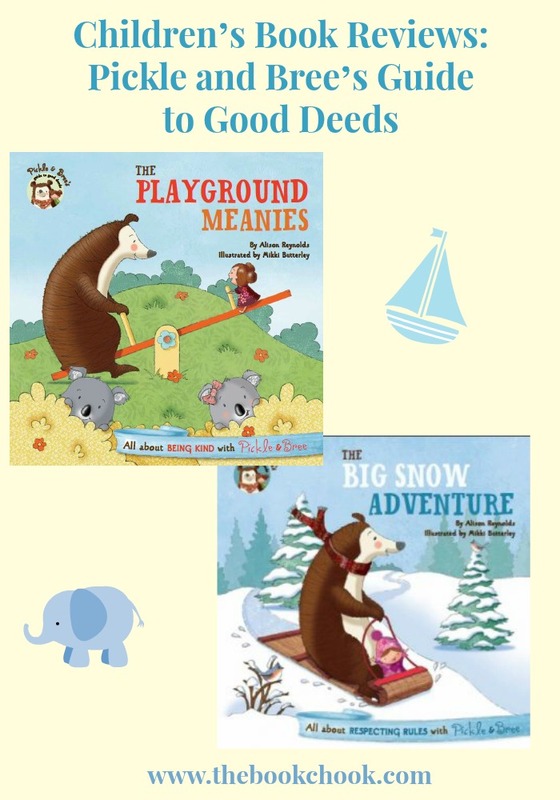 Today I’d like to introduce you to two books in the series: The Big Snow Adventure and The Playground Meanies. But first - I always have a concern about books that want kids to learn from them. Is a book going to make me cringe because it’s preachy? Is a book going to have unrealistic characters and stilted dialogue? Will a book be something kids actually want to read? Kudos to author Alison Reynolds for the Pickle and Bree books! Together with illustrator Mikki Butterley, Reynolds has created books that get the balance exactly right. Reynolds uses language and incidents kids will readily understand, and weaves stories that will engage both children’s hearts and their minds. Butterley gifts young readers with cute characters and colourful, active scenes that help bring Pickle and Bree to life for kids. I liked the way the characters in these books are not always good or bad, just like in real life. Kids will identify with both Pickle, a bear, and Bree, a little girl. In The Playground Meanies, Bree encourages the other characters not to be mean. But in The Big Snow Adventure, Bree herself learns a valuable lesson about the impact her thoughtless actions have on others. I think it’s important for kids to realise that being human is about doing our best, and when we make mistakes, trying again. So far, I have read The Big Snow Adventure and The Playground Meanies. You can also grab The Decorating Disaster and The Birthday Party Cake for your kids. I have no doubt the whole set of Guide to Good Deeds books would make an excellent acquisition to libraries and homes everywhere. Check them all out via Reynolds’ website. I’ll be adding these two books to my List of Children’s Picture Books about Friendship.